As I rewrote chapter 1 of my novel, all seemed well. My character’s voice comes through strong and I’d built up the tension. But as I worked through following chapters, I found trouble. Every time he got in a tight situation, my main character chewed on his lip. Every. Time. When he was frustrated, he’d heave a great sigh. By the climax, he’d be lighted-headed and lipless unless I did something about it. 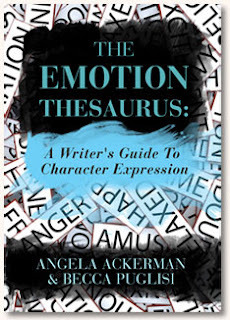 Fortunately, writing partners Angela Ackerman and Becca Puglisi have created the The Emotion Thesaurus: A Writer's Guide to Character Expression for times just like this. The listing of 75 emotions ranges from adoration and anxiety to somberness and terror. Before reviewing it, I decided to test the thesaurus. I’d rewrite one chapter to make sure my emotional details were varied but accurate at the same time. The first emotion that I looked up was Excitement. Each entry includes a definition of the emotion (the state of being energized or stimulated and provoked to act). That sounded right but my character was standing like a lump waiting for someone to catch up. The listing included almost a full page of physical responses. Soon I had my character fidgeting as he waited—a response that fit his personality and was more accurate than what I had previously written. Because this part of the story was moving at a fast pace, I didn’t include internal sensations or emotional responses, but those are part of the listing as well. If my character was trying to look bored instead of excited, I might have focused on an internal response or the choices for suppressed emotion. If I’d done that, I wouldn’t have needed a cue to remind me that my character, a nine-year-old who vibrates with energy, wouldn’t stand still while he was waiting. Can’t find the emotion you need to describe? Try again. At one point I tried to look up Enthusiasm which isn’t listed. Why not call it Excitement which is just as accurate? It isn’t my names for the emotions that need to be varied, but my character’s reactions. Get a copy of this reference in time to rewrite your next fiction project. Your character may be able to release her clenched jaw and simply thrust the paperwork at someone in frustration instead. She’ll be reacting in a greater variety of ways and you’ll have some hints for how to make her emotions more obvious. Winner will have 48 hours to respond or a new winner will be picked. By entering you agree to the rules of the contest. Good luck! I have this book already, and I have to agree that it's a very handy book to have in the bookshelf. This sounds like a wonderful resource--one that I'd never heard of until reading your post, and one which I'm sure my students would appreciate. There are times that I head to the mirror when I'm working on a writing piece. Why? Well, when I am writing about a character's physical reaction, I act it out, and look at what my shoulders are doing...what happens with the facial muscles around my mouth...what are my eyebrows doing...and so on. You provided some great reminders in your post, Sue. When we write a moment in a story, it should be as vivid as a scene on the movie screen. Now that is an awesome prize. Totally in! I just added this book to my wish list. I'm working on a ya fantasy novel. I'm working on a novel about a mother who is dying and the drama that entails while she tries to get her family affairs in order. Couldn't wait - bought my copy on Kindle. Great idea. Thanks! I'm working on revisions to a contemporary MG right now. I love the idea of this book; could be VERY useful! Thanks for the giveaway! This sounds like it's exactly what I need! If I don't win, I'm going to buy it. Thanks for the review! How cool that I JUST discovered their blog and this resource JUST YESTERDAY and added it to my Kindle wishlist. A sign I might win the giveaway? Either way, I will get my hands on this book. Although I don't write fiction, I think would be a fantastic resource! I'm working on too many things! A couple of paranormal romances, some contemporaries, one with romantic suspense, even a YA series! This book sounds like a writer's best friend! I would love to get this resource! I'm writing my 3rd Young Adult fantasy. I gave my copy to a friend, I'd love to have my own. I am working on a short story. Would love to have this book in my Library. Finishing book 2 of the Little One series. I have enjoyed referring to the sampler of emotions on Angela's blog. The book sounds fabulous! Great giveaway I hear it's a great thing to have. Currently I'm working on a paranormal story as well as a Bigfoot piece for an upcoming contest. Where has this book been for my earlier writings? This sounds fabulous. I'm so glad to read this review and excited about the giveaway. I'm a regular blogger for my own blog and several others so write weekly. This sounds like a really great resource! I can't wait to get a copy. I will also promote it to my readers in my newsletter and on my blog. This sounds like a perfect reference book for a novelist. This sounds awesome, if i don't win, I'll cry then have to go buy it! It looks like a terrific book! As writers I think many of us tend to get into word ruts, repeating words and phrases. What a wonderful tool this is! Becca and I are so pleased that The Emotion Thesaurus helped to revamp your first chapter, Sue! Thanks so much for test driving the ET and for sharing how it went with Muffin readers. I read about this book on more than one blog post before it came out, and I'd love to have a print copy! I'm definitely entering in the Rafflecopter. Thanks! Sounds like a great reference book! Thanks for this giveaway. I'm currently working on my Camp NaNoWriMo project - just plotting, not writing yet. Oh my gosh! Exactly what I was looking for last week. I scoured blog posts and searched my blog subscriptions through Google Reader, looking for something that would help me to vary my characters' physical gestures to depict emotional response. Too much smiling, nodding, head shaking... You know how it is. I've got to get a copy of this book. This book sounds very interesting and something that I need to add to my shelf. Editing my second novel, with two in the pipeline. This book sounds perfect! I love their website with the character, setting, weather and emotion thesaurus details. So helpful! I am currently working on two projects: the third book in the Between series, and a new YA contemporary novel. Thanks for the giveaway. Fingers crossed that I win! A little of this, a little of that. Whichever one the muse selects, I pick up. Like Sioux, I act things out. I look for videos. I check out Google Images. This took will be at the top of my list where emotions are concerned. I'm currently working on a self-help book called 'Unconventional Methods of Book Promotion and Networking.' The title is pretty explanatory. I'll be using Indiegogo to raise funds to publish and promote the book. I'm also a fiction writer, but I won't be concentrating on fiction until later this year. I'm working on completing a novel I started seven years ago. Back then, I put it in a drawer, forgot about it and wrote other things. Now it is being rewritten. Tears stream down my face as I think about the book in my hands. I hold it close to my chest, hoping beyond hope that the pages will help ease my pain. I shudder at the thought of giving it up, but I need my freedom. :) I'd like to win the book. I would LOVE this. I have a pretty good vocabulary for character expression, but I get stuck in ruts! This could be incredibly useful I am sure. I drop into habits way to regularly. Books like this make me happy. I would love to add it to my collection. My daughter sent me the link to this with the comment that if we don't win it we might just have to get a copy on our own. It sounds like the perfect tool for any writer, thanks for bringing it to our attention. I look forward to exploring the rest of your blog. Thanks. The Bookshelf Muse has always been very helpful, especially during NaNoWriMo. Thanks for the giveaway! I'm working on a Fractured Fairy Tale as well as a Regency Novella. I'm editing the first draft of my second novel. The Family Christmas Newsletter. Seriously. I want to write a Children's book and have been but have not finished yet. I'm currently working on the trials of a single father raising his daughter after her start in life was a rough one. Thank you so much for your entries and comments. The response has been fantastic. We held a random drawing via Rafflecopter and the winner is... Tiffany T. Cole! Congratulations, Tiffany! You won a copy of The Emotion Thesaurus: A Writer's Guide to Character Expression. We will send you an email requesting your mailing address. It will be coming from editors[at]wow-womenonwriting.com. For everyone else: If you didn't win, definitely consider adding this excellent resource to your bookshelf, if you haven't already. Also, stay tuned for more writerly giveaways here on The Muffin. Thanks for your participation. I've been using The Emotion Thesuarus for about a month now, and I can already see a profound improvement in the variety of emotions my characters are able to show. I'm going to have to go back to earlier chapters (those I wrote before I owned the book) and re-write emotional responses, using this fantastic tool. Otherwise, readers will note the significant difference!